Struggling Fighting Gamer? 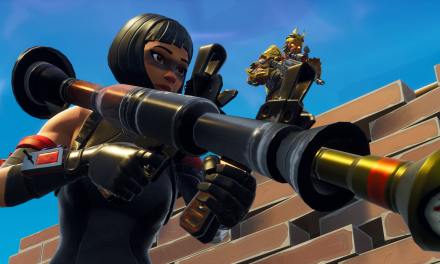 5 Tips to Help Out! Fighting games are among my first passions when it comes to gaming and unfortunately, not every one is naturally good at them, myself included. However, with hard work, dedication, and a little bit of “know-how” most can reach above average status fairly easily and can at least win above half of their total matches. This editorial will focus around 5 tips I believe will help out a vast majority of new fighting gamers, as well as though that have been playing for a while and just have no idea where they are going wrong. Do not get me wrong, I am by no means Daigo “The Beast” Umehara or Justin Wong; but I think I will give sufficient knowledge to help out these who want to get better! So take a look! Even before we start I think you should know a thing or two when it comes to fighting games as opposed to games of any other genre. Fighting Games are all about knowledge of your opponent’s character, your character’s options, and what to do in certain situations that present themselves. You will only learn this through training for “impossible” situations, learning to adapt for multiple “what-if” scenarios, and the bevvy of in-game experience you will have over the course of your Fighting Game career. Also one important think you should know before hand, you will lose, A LOT. Most times in Fighting Games, those who are truly good spend just as much time, if not more time, in solitude in Training Mode than in actual combat with their opponents (Think about how a Boxer or MMA Fighter spend months and months of training for only about 1 hour total time in the ring, at the end of most professional fighters careers they have trained more than they have actually had matches). Without dedication to training mode and having a mindset to learn counters to frustrating or seemingly impossible attack-strings/mix-ups, you will get no where. With this in mind, if you are someone who are playing for fun and do not care how much you win or lose, pay no mind to this, if you are playing with an intent to win then I suggest you heed with this guide has to say and prepare for long hours of nothing but practice (And while some are actually skilled enough to learn everything they need to know in the midst of combat, know that it is not very common for them to excel at high-level). Patience, Dedication. So, I guess this is an “unofficial” tip that should be self explanatory: You are going to need “PRACTICE”, a LOT of it. TIP#1 – LEAVE THE “SCRUB MENTALITY” BEHIND YOU! Scrub Mentality in Fighting Games is something we refer to as expecting everyone to play by the rules you have made up in your head as being “fair”. You say someone is cheating just because they throw 50 Hadokens during the course of a SINGLE round in Street Fighter IV, if someone grabs you repeatedly in Soul Calibur V because you are blocking you say that is lame and they are grab-spamming, or even in something like Ultimate Marvel vs Capcom 3 if they do the “Lightning Loop” with Zero and kill you. Guess what? It is all fair if it is not an unintentional glitch in the game that immobilizes you (Dead Pool/Trish glitch in U.MvC 3) or freezes the game (Rolento post patch glitch in Street Fighter x TEKKEN). I wrote an article pertaining to this subject I encourage you to read Don’t be a Scrub! Basically, there are a thousand ways to play a game and not everyone will play it as you do or how you thik they should be playing the game, or the character. You have some people who will get up in your face and rarely give you a chance to attack, you have some people who will block every attack and break every throw and only be aggressive when you can get a hit in, others are a combination of both. It is important to know that these are all valid styles, and while they may be aggravating because of how you choose to play, they are still legit tactics which, while you may not like, you must RESPECT in terms of their viability. Now, recognize, you do not have to mimic them or attempt to play like them, but you have to find a way to counter it or continue to make excuses and lose to it, it is not going away whether or not you choose to call it cheap. 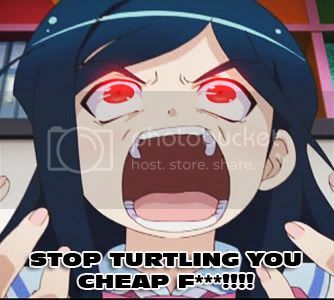 The significance surrounding this is because by limiting what you think is “fair” and “cheap” in regards to gameplay lowers the overall amount of techniques you are allowing yourself to use, which in turn lowers the amount of situations you are prepared for and different play styles you may be able to win against. Also, if you are someone who submits to a style without ever wanting to figure out a counter for it because it is “impossible to win” against it, you will forever be stuck without being able to make any improvement because you have already shut down that avenue in your own mind (You have lost before you begun). Something I also want to shed some light about is that it does not matter what form of controller someone is using to play a Fighting Game (Controller “Pad”, Arcade Stick, Hit Box, Rock band microphone) it does not make a different in terms of their skill or execution technique. Wolfkrone, consider the best Street Fighter IV Viper player in the world (She is the most complex to use) plays on controller, while the best Ryu in the world, Daigo, plays on Arcade Stick. The medium does not matter as long as you know your stuff and practice on it. When playing Soul Calibur V I had someone who said grabbing was cheap and lost to me because of it (Watch the video HERE). Later on he came and apologized and said that I was right, however, because I was able to counter him so well because he had not adjusted to breaking grabs to counter his weakness, I won. In the end, it was his own mentality that defeated him. TIP #2 – LEARN THE MECHANICS OF THE GAME! BlazBlue: Continuum Shift‘s Tutorial Mode. When beginning a new game, even if it is nothing more than an upgrade to a currently existing game (Such as Super Street Fighter IV: Arcade Edition to Super Street Fighter IV: Arcade Edition version 2012) you need to learn the intricacies of the system you are going to be fighting in. What I mean by the intricacies is the way the character moves (And any movement options like back-dashing, air-dashing, etc. 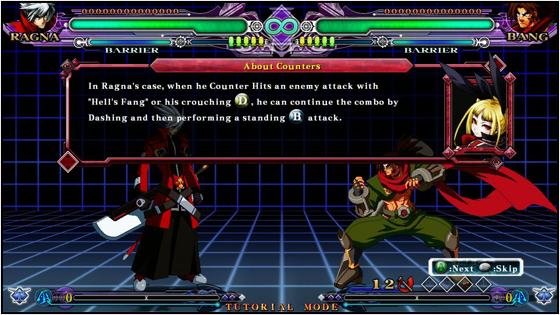 ), options for blocking and breaking out of combos if any (Such as Barrier Blocking in BlazBlue: Continuum Shift or Combo Breakers in Killer Instinct 2), and any special mechanics that are activated under certain conditions (Such as Pandora Mode in Street Fighter x TEKKEN or RAGE mode in TEKKEN Tag Tournament 2); even such minor things as how to grab and grab break, which can widely differ from game-to-game. The reason why this is so significant is because, unless you know all options that are available to you, you are essentially playing cards without a full deck. Sometimes a situation will seem impossible simply because you do not know the mechanics implemented into the game which takes care of what you think is a problem impossible to get out of. For instance, if you were getting rushed down by Dante in Ultimate Marvel vs Capcom 3 in the corner and he used assists to cover the gap between his recovery to keep you pinned in the corner, if you do not know how to do “Advancing Guard” you will be forced to stay in the corner blocking and taking “Chip Damage” or being hit. The best way to learn the mechanics are to read the instructional manuals that are included normally on the left-side of the game case or to participate in the in-game tutorials associated with the Fighting Game of choice, such as TEKKEN Tag Tournament 2‘s “Fight Lab” or BlazBlue: Continuum Shift’s “Tutorial Mode”. Often these things will instruct you on how to perform basic maneuvers and techniques which are universal (And if there are any exceptions they usually state those characters). They are a great learning point and will help you to understand the system in its entirety and will leave you with enough information about the system to where you can experiment with it in different situations and find the optimal time to use it in a match. An example of how this can save is that I was fighting someone who happened to be a very good Hakumen in BlazBlue, knew all the combos, knew a good amount of setups and had the advantage in the “Character Match-Up” (I was playing Makoto), but he did not Barrier Block nor did he use the Counter Assault, so I was getting away with a lot of pressure and nonsensical things that someone who took advantage of their Anti-Rush Down options would not have had to deal with. In addition to just these basic mechanics you will eventually find players doing things that you should NOT be able to do because of “glitches” that are an exploit within the current system that are not game-breaking, but are pretty powerful nonetheless ( Such as Wave Dashing, Dash Dancing, and L-Cancelling in Super Smash Bros. Melee; or the “DHC” Glitch in Marvel vs Capcom 3: Fate of Two Worlds). While these things are not covered in the game because they are not intentional, once they are known the general fighting game populace will continue to utilize them unless the technique is banned at major tournaments (Which does not help online players) or the company who made the game patches it out so it is no longer usable (Such as the “Quick Step 4G” glitch in Soul Calibur V). I would suggest you learn and utilize these advance techniques while they are usable because you will need them against others who also use them (You can find out about these by visiting any popular website for fighting games, which I have in the Extra section). One of Ryu’s Trials in Street Fighter IV. Ever heard of the phrase “Jack of all trades, master of none?”, I think it is bad to be that way in Fighting Games. Some people like to learn multiple characters at a single time (And some games you will need to know how to play more than one, such as The King of Fighters XIII and Ultimate Marvel vs Capcom 3), but something I like to do is to pick a character and completely learn everything about them and then move onto another character if I find I like someone else more (Once this process is well underway) or need another character to deal with the weaknesses of the one I already have. This is because I find you can beat more people by being exceptionally with a single character (In 1v1 Fighters) than being mediocre with a whole host of characters (Unless that person has bad match-up experience, but if you learn a character this should be covered). Not only this, but learning a character totally better reinforces how to use the game mechanics properly, better honing what you learned in Tip #2. Capcom 3; and some games you will have to practice manually and the command list (Found from the in-game menu) will have a few combos for you to learn, such as the games TEKKEN and Virtua Fighter. A lot of the times the later missions are not practical in an actual match because of the amount of execution needed to perform the move (Like those in the King of Fighters XIII) or because it has to be done from an exact position on the stage, which is not liable to happen in an actual match. However, what these do is give you the basic fundamentals to how combos go together so you may go into training mode and come-up with your own practical combos. When it comes to combos with a character you are going to want to train in three categories: Combos that leave your opponent in a position where you can “reset” them (Leads into another combo because it puts your opponent in a situation where he has to guess which side you will be on or whether or not they need to block high or low), Combos that do the maximum amount of damage possible, or Combos that lead into their Super Art/ Critical Finish/ NeoMax or whatever their most damaging special move is. You can learn these by coming up with your own combos, going to character specific forums, or by watching matches or combo videos on YouTube and jotting down how to do them. I always think it is best to get down basic “Bread-and-Butter” combos first, which are combos you can perform easily and are easy to land no matter where an opponent is on the screen. You will then need to now how to convert combos off of “random hits” i.e., if you caught someone with a jumping medium kick you did not know was going to crossover, how do you make a combo from that situation? After you learn these it is good to learn “Character Specific” combos that are combos that only work on certain characters (Such as Makoto’s j.C (delay) C, mix-up on Iron Tager in BlazBlue: Continuum Shift). 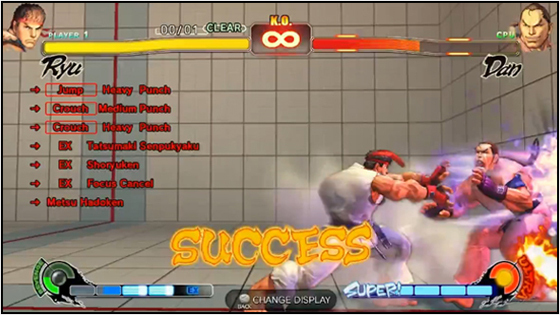 After you learn all these you learn high impractical combos that you are only able to land under certain conditions. I normally practice against CPU opponents first in order to get comfortable in actual combat situations; then I turn up the CPU to be unpractical (The hardest levels) in order to get use to the crap that is probably going to happen against normal people, and to fight when I cannot effectively do combos. These things help a lot against human players because you already have gotten use to doing your combos in the heat of battle, and while human players are typically smarter than CPU opponents (And cannot react nearly as fast sometimes because CPU is reading your inputs), it is good to know that you can do your combos without them standing completely still like they do in training mode. When all of this is said and done you want to start learning advanced things your character may be able to do that no one, or only a few other characters posses (Such as Ken’s “Kara Throw” in Street Fighter III: Third Strike, or Cody’s Infinite in Street Fighter Alpha 3). If you are going to learn to play the character, every single aspect of them must be addressed. It is also good to learn which moves are good for stopping jumping opponents, guard crushing opponents, and moves that leave you in “Frame Advantage” to setup “Frame Traps”. After you learn all these things it is good to begin learning characters specific match-ups; which character can your character easily beat? Who are they on even footing with? Who do they lose to and how will they stand a chance of beating them? It will not always be an uphill battle against characters, for instance: In Super Smash Bros. Melee, Falco is considered to dominate Shiek, Shiek is suppose to be pretty even against Fox, while Fox and Falco are pretty even (Where as you would think if Shiek and Fox are even, then Shiek would be even against Falco, not the case). Also, it plays in-tune to an opponent’s skill; even if a character is meant to be bad, the character at a disadvantage can still win based on the other players knowledge of how to deal with his weaknesses and the skill he is at with that character. 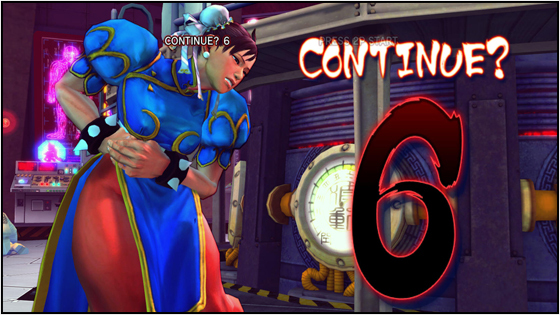 Chun-Li’s continue screen from Street Fighter IV. The best players are those that are flexible and are able to adapt with the situation and use a variety of styles at any given moment; however, all these players, even the most high ones, gain this and their play style through experience. Justin Wong is known for being very aggressive, Chris G is known for doing whatever it takes to win (And I mean anything), Daigo Umehara is known for his patience, spacing, and adaptability. However, how did they develop these styles? They clock in hundreds upon thousands of hours practicing and fighting against other people who have put in just as much time in as they have and learn from it. First off, you will begin to learn what type of play style best suits you based on what is comfortable for you. Maybe you are better at countering what your opponent does, maybe you are better at attacking and not giving your opponent time to think; maybe you are good at attacking from a distance and frustrating them. You can begin your own style and then grow to mastery it once you realize what works for you against most people, you will establish a solid foundation of play style to further practice around and hone to your liking. Not to mention that learning in training mode is one thing, but putting it to use in actual combat is another thing in its entirety. You may find that things you practiced in training mode are significantly more difficult to land on an actual opponent; you may find someone who adapts to your strategy amazingly quick, or someone who plays completely unorthodox’d and catches you off balance. Also, you mind find more techniques or mix-ups that work on human players that are “gimmicks”, which catches each new opponent who has never deal with it off guard. So many more things can be found in combat that you can take back with you and practice on to perfection. By having a regular training partner, or playing with those more advanced than you are regularly, you can begin to learn what you are doing wrong and correct them. Perhaps you have a bad habit that lesser players are not hip to, yet the same strategy gets you destroyed easily by someone better than you (Such as Alpha Patroklos in Soul Calibur 5 22BA, an inexperienced player would block the whole thing, someone who knows the match up would duck the A and punish). It is impossible to eliminate the gaps in your offense and defense unless you play hard and play regularly, but most of all you have to PLAY TO LEARN, not play to win (Though you are also doing this, it should not be your whole goal). Not to mention that you can learn tips and useful training advice from someone above your league, including tips and tricks by watching how they play. Also with this in mind, one of the greatest players I have known “Bus Orez” said, “If you aren’t losing, you aren’t leanring”, this is true. If you are constantly winning then how will you ever find what you are doing right? Losing keeps us humble, it also tells us we have room to improve and we are not the greatest yet, and even if someone wins Evo today, you could lose still lose the following year in the same game. I know losing has kept me down to earth when I started feeling myself (Ask Ray Ray about feeling yourself), and it stops you from getting too big of a head and keeps you dedicated to improving. Not only this, but you may find that you are able to finally defeat someone who is a lot better than you initially because they did not grow or did the same tricks over and never found someone to counter them. An example of this is me fighting an Astaroth player on Soul Calibur V; the first time I fought him with my a.Patroklos I was utterly destroyed repeatedly because I did not know the match up, did not know how to Just Guard, and I was pretty weak when it came to Just Framing. Eventually I fought this same player again in Ranked, and while it was a close match, I won. The significance of this is, that even if I lost, I was actually able to give this player a fight where I was nothing more than a moving training dummy he dominated with ease. Another reason I say seek out those players better than you is because you will NEVER improve if you do not constantly try to cover up your weaknesses. I had a friend whom cheered for me constantly, yet she never wanted to play me but only played with my friends who she thought she could beat. She said she thought she could never beat me which is the reason she never attempted, nor did she ever try to get better; so I took her off my friends list. I am someone who wants to improve and I generally only try to keep people around who also want to do the same, even if they never rise above average, you should always give it your full effort. TIP #5 – NO MATTER HOW BLEAK THE SITUATION, NEVER GIVE UP! By far one of the most under-looked things that goes with the Fighting Game genre is the concept of “Never Give Up!”. You will be surprised by exactly what it is possible to come back from, even when it looks like you have a billion to one percentage. Well, guess what? You STILL have a 1% chance. Situations like above in the video with Diago Umehara and Justin Wong or the famous Evo Moment #27 moment with Justin’s Cyclops comeback would not have been possible if they did not fight to every single pixel of health. There will be many times where you will want to “Rage Quit”, there are also many times were you fill like someone is completely destroying you and are in a situation where you could get perfected. Do not worry, fight until you lose because until you do, you have not. There is no worse habit a fighting gamer can possess than quitting or giving up when it seems like the situation is not going in their favor. Take the loss and move on, or do your best because you never know what can happen. I do not need to go into an “in-depth” explanation for this, but we have seen amazing comebacks all the time in the fighting game community, more so than probably any other facet of video games. It is not over until you see “You Lose”, “K.O.”, “Ring Out” or however else there is to forfeit a round. If your opponent is going to win, make him sweat bullets doing it. They say, “Even a cornered Rat fights back”, and often times you will not believe how adrenaline and having your wits about you, not to mention your opponent eagerness to close out the match could tip the scale in your favor. Here I am going to give you a couple of things to help you out in fighting games that are pretty mainstream but new fighting gamers might be completely oblivious to. Things like move notation, websites for specific games, and a few terms that are used within games. Move Notation: Move Notation is essentially words, numbers, or directions which stand for a specific motion you make with your controller peripheral of choice to execute a move, for instance: Hadoken is executed by pushing down, diagonal-down-forward, forward and Punch. However, you can also say that you use 236+P to execute a Hadoken, or QCF (Quarter-Circle Forward) + P, and this is referred to as “Hadoken Motion”. Shoryuken motion is Forward, Down, Down-Diagonal-Foward or 623. You are saying “236+P” because, if you look at a keyboard, it is made up of three rows. The bottom row has 123, the second row has 456, and the third row has 789. If you think of these numbers as directions you push your controller in, you have a full circle, with 2486 being your cardinal directions, 1793 being your diagonals, and 5 is when you are not pushing anything at all. Quarter-Circle means just that, a Quarter (A fourth) of a circle. So, by that logic, a Half-Circle Motion means Half of a circle, and a Full-Circle (Normally referred to as a “360”) is the entire circle. Now, if someone was to say “Half-Circle Forward” (HCF) or “Quarter-Circle Back” (QCB), it means that you are to end the motion with that direction (So HCF would be 41236 and QCB would be 214). Also, in things like TEKKEN where you read buttons by numbers (1,2,3,4) or The King of Fighters where things are referred to by letters (ABCD), you will need to understand the lingo specifically by what buttons they mean in order to read forum talk correctly, “Dude, you perform Terry’s Rising Tackle by doing 2(Charge)8+C”. Basic Terminology: In fighting games you have some terminology which is related to all games in general. I am going to tell you ten here get you started, but you will find many more where this came from and even more specific terms once you get into specific games. Evolution World Championships (EVO) – Largest Fighting Game Tournament in the world (You can read my pre-Evo 2012 HERE). Chip Damage – Attacks that deal a little bit of damage, even if an opponent is blocking. Overhead – A standing attack which will hit crouching opponents. Mix-Up – A situation where you opponent will have to guess exactly what you are going to do in order to not get hit, usually they have to guess whether to block high, block low, or to throw escape. Dropped Combo (“Drop”) – When an execution error has caused them to accidentally mess-up a combo that would not have broken otherwise. Option Select – A move that allows escape from an opponent’s mix-up by allowing the computer to choose the best method. Reset – A combo which the player Drops intentionally to go for a Mix-up into another combo rather than guaranteed damage. Clutch – When someone wins from a situation they are not suppose to win from / Come back. Frame Advantage/Disadvantage – When a move allows you to either attack first, or your opponent to attack first after a move has been guarded. Zoning – When someone uses projectiles in order to control space on the screen. Websites: These Websites are dedicated to fighting games though, some of them specialize in quite a few ones, I will give the ones they are probably better to go to for. 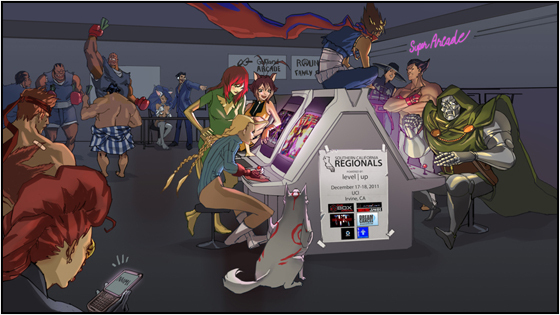 Shoryuken.com – Street Fighter, Street Fighter x TEKKEN, and Marvel vs Capcom. DustLoop.com – Guilty Gear and BlazBlue. MayonakaMidnight.com – Persona 4 Arena. DOAWorld.com – Dead or Alive. 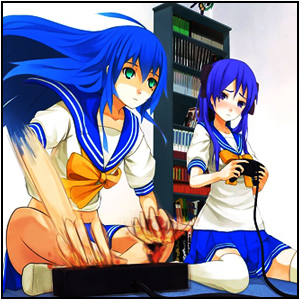 Being a Fighting Gamer is one thing, being a GOOD fighting gamer is a whole other one in itself. You will have to take the time and dedicate yourself fully to a game in order to be good and go far and beyond the tips I gave you if you want to compete on the “World” level. These tips will hopefully help you on to you way of becoming a decent fighting gamer, or at least give you the basis and act as a road map on where to get started and instill within you the correct attitude (You need plenty of practice and do not call things cheap) in order to stick around long enough to succeed. By now means is this a easy genre to get into, as those who have been playing for a while will likely kick you around for a while, but take it in stride and try to get to that level, if you never give up you will have nothing to worry about. I hope these tips have been beneficial, please let me know. Thanks for reading, Sayonara! PreviousDmC: Devil May Cry, Current Analysis & Impressions. NextBayonetta 2 Announced! What? It’s a Wii U Exclusive?! Nice use of pictures and videos; I really enjoyed this article. Thank you very much! I am glad you enjoyed it!